The National Youth Service Corp (NYSC) has again advised corp members to be security conscious during the service year. Mr. Muhammed Momoh, Lagos State NYSC Coordinator, gave the advice in an interview with the News Agency of Nigeria (NAN) on Wednesday in Lagos. Momoh said that corp members needed to be safe for them to serve the nation effectively. “We inculcate security consciousness in them right from the orientation camp because they need to be secure to effectively serve the nation. “They are taught to be conscious of their environment and of their neighbours and to report suspicious movements to the authorities. “The camp itself is a closed and secured environment which does not admit individuals who have no business there, and our collaboration with security agencies has been very effective,” he said. He said that the NYSC on its part would not post corp members to communities where there were security threats. Momoh also advised corp members to always disclose their health status to enable the corp to take appropriate decisions concerning them. “It is in their best interest to disclose their health status. “We collaborate with all the health institutions in the states and they always attend to ailing corp members. “Presently we have a corp member at the Psychiatric Hospital, Yaba; if he didn’t disclose his health status, we would not be able to cater for him,” he said. He said that such disclosures would also earn affected corp members posting to areas where they can get family support, adding that health status did not disqualify anyone from being called up for service. He urged them to be law abiding and to obey all camp rules during the three weeks orientation course. 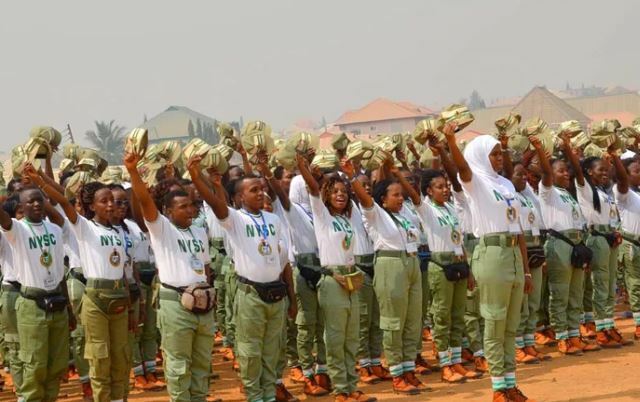 The News Agency of Nigeria (NAN) reports that 3,087 corp members, comprising of 994 males and 2,093 females, were sworn in for the 2018 Batch “B” service in Lagos State last Thursday. On the occasion, Gov. Akimwumi Ambode advised the corp members to support the community security initiatives of the state to contribute to building a crime-free Lagos. He assured them that Lagos State would always provide the necessary support to them to ensure that their service year in the state was memorable. “I want to emphasize that Lagos State is strongly committed to providing the necessary support and enabling environment for corp members in the state. “I implore you all to key into our community security strategy of “if you see something, say something” by calling our toll & free lines “767” or ” 112′,” he said. Ambode urged the corp members to take advantage of NYSC skills acquisition initiative, pledging the state government’s support for entrepreneurial initiatives of corp members. “I enjoin you to take a keen interest in all camp activities, especially the training on skills acquisition and entrepreneurship development. “Our government, through the Lagos State Employment Trust Fund Initiative, is in partnership with NYSC in the state to fund entrepreneurial start-ups for corp members,” he said. Ambode’s address was delivered by Mr. Akinseye Oladejo, Lagos State Commissioner for Regional Integration and Intergovernmental Affairs. Mrs. Adebisi Femi-Segun admitted the oath of allegiance on the corp members on behalf of the Chief Judge of Lagos.